Dallas: Five Police Officers Shot Dead; Obama Condemns “Vicious, Calculated and Despicable Attack” | Democracy Now! In Dallas, Texas, five police officers have been shot dead and six others wounded. They were shot while patrolling a demonstration against the recent police shootings of Alton Sterling in Baton Rouge, Louisiana, and Philando Castile in Falcon Heights, Minnesota. Authorities have identified the gunman as Micah Xavier Johnson. Police say he was killed by a police robot after a standoff. At a press conference, Police Chief David Brown said officers conducted negotiations with the gunman before they killed him. Brown said the gunman told officers that he “wanted to kill white people, especially white officers.” We hear President Obama’s remarks and speak to Graham Weatherspoon, a retired detective with the New York City Police Department. AMY GOODMAN: In Dallas, five police officers have been shot dead, six others wounded. The police were patrolling a demonstration in downtown Dallas against the recent police shootings of Alton Sterling in Baton Rouge, Louisiana, and Philando Castile in Falcon Heights, Minnesota. Videos of the two African-American men being killed sparked protests across the nation. Authorities in Dallas described Thursday’s assault on the police officers as a planned ambush. Authorities have not yet released information on the suspected shooters. One of the suspected snipers reportedly died from a self-inflicted gunshot. Three other people have been taken into custody. The gunfire erupted at around 8:45 p.m. local time, just as the peaceful protest was wrapping up. Four of the slain officers worked for the Dallas Police Department; the fifth was part of the Dallas Area Rapid Transit force. He was a DART officer. At least one protester was injured in the shooting. Earlier this morning, President Obama spoke in Warsaw, where he’s attending the NATO summit. PRESIDENT BARACK OBAMA: We still don’t know all the facts. What we do know is that there has been a vicious, calculated and despicable attack on law enforcement. Police in Dallas were on duty during—doing their jobs, keeping people safe during peaceful protests. These law enforcement officers were targeted, and nearly a dozen officers were shot. Five were killed. Other officers and at least one civilian were wounded. Some are in serious condition, and we are praying for their recovery. As I told Mayor Rawlings, I believe that I speak for every single American when I say that we are horrified over these events and that we stand united with the people and the police department in Dallas. According to police, there are multiple suspects. We will learn more, undoubtedly, about their twisted motivations. But let’s be clear: There is no possible justification for these kinds of attacks or any violence against law enforcement. The FBI is already in touch with the Dallas police, and anyone involved in these senseless murders will be held fully accountable. Justice will be done. I will have more to say about this as the facts become more clear. 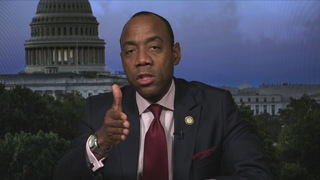 For now, let me just say that even as yesterday I spoke about our need to be concerned as all Americans about racial disparities in our criminal justice system, I also said yesterday that our police have an extraordinarily difficult job, and the vast majority of them do their job in outstanding fashion. AMY GOODMAN: President Obama, speaking in Warsaw earlier this morning as news about the Dallas shooting unfolded. Former Illinois Congressman Joe Walsh sparked controversy by declaring a war against President Obama and Black Lives Matter activists. Around 9:00 p.m. last night, Walsh tweeted, quote, “3 Dallas Cops killed. 7 wounded. This is now war. Watch out Obama. Watch out black lives matter punks. Real America is coming after you,” he wrote. He later deleted the tweet. This comes as many commentators are inaccurately claiming there has been a rise in violence against police officers under the Obama administration. In reality, the opposite is true. During the first seven years of Obama’s presidency, an average of 54 officers were shot and killed. That’s less than the average of officers killed each year under George W. Bush, Bill Clinton, George H.W. Bush, Ronald Reagan and Gerald Ford. In fact, the safest two years for police officers over the last century were during the Obama presidency: the years 2013 and 2015, which also coincided with the rise of the Black Lives Matter movement. We begin today’s show with two guests. Graham Weatherspoon is with us. He’s a retired detective with the New York City Police Department. He’s also a board member of the Amadou Diallo Foundation. And Marc Lamont Hill rejoins us, journalist, distinguished professor of African-American studies at Morehouse College in Atlanta. He’s just written a new book; it’s called Nobody: Casualties of America’s War on the Vulnerable, from Ferguson to Flint and Beyond. GRAHAM WEATHERSPOON: Thank you, Amy. AMY GOODMAN: Graham Weatherspoon, let’s begin with you. Your reaction to the horror that unfolded last night, carrying on for hours in Dallas, just as this peaceful anti-police brutality protest was wrapping up, snipers opening fire on Dallas police? GRAHAM WEATHERSPOON: Yeah, the last three days have been numbing in this country, and we are at a very pivotal apex right now in terms of where this country is heading or where it will wind up very shortly. I’ve carried the caskets during my tenure. I have stood over people that I knew laying on the ground. My partner was shot in the face. And I’ve had people try to kill me numerous times. But what we saw last night—and I didn’t know this until I woke up this morning around 6:00—it took me back to a conversation I had with Ray Kelly a few years ago, when I asked him, I said, “Do you want urban warfare in the City of New York?” Because people had come to me years ago, after Amadou had been killed—and these were ex-military personnel—and they said they were tired of it. And they said, “We’re going to start killing these cops.” And I said, “That’s not a good thing to discuss or even recommend.” But it is a reality. There are people out here who—and we’ve seen it just in the political spectrum over the last few months with comments that people have made and just the fanning of the flames. We now know that whoever these individuals were—and I had said this to Ray Kelly—a bullet-proof vest is not going to protect a police officer, not from someone who is using a high-powered weapon. So, unfortunately, it has come to pass, not here in New York, but in Dallas—and I pray it never happens here—but there are people out there who are not operating on all cylinders, who have weapons. My son, who is in the military, told me some years ago that they were weeding men out of the military who were part of the white supremacist movement, and they were joining the military just to get the training. You know, there are a lot of things going on in the back that you just—and the general public doesn’t have an idea of what is happening. So, the FBI and JAG and other units of the government were trying to find out who those men were, to pull them out of the military so they couldn’t get that type of training. But then you look at the situation last night: A peaceful demonstration erupts into total chaos. I did an interview yesterday on News 1, and I said, “We cannot afford to move with the eye-for-an-eye mentality.” Innocent people wind up dead on both sides. We see this in Iraq right now with these insane bombings that are going on. We’ve seen it in Palestine between the Jews and the Palestinians. Nobody wins. There has to be a time where we come to the table to truly address the issue of race in this country. It is a cancer that has polluted not just this country, but it’s polluted the world. And until we choose to come and sit down and talk, number one, I believe that most Americans live in two states in this country—the state of denial and the state of fear.